James Wade is aiming to build on the form he showed last week as bids to be first player to conquer Phil Taylor in the 2013 McCoy’s Premier League when the pair meet in Exeter this evening, while newcomers Michael van Gerwen and Robert Thornton are looking to extend their unbeaten starts. Wade averaged over 100 in a dominant display to see off Adrian Lewis in Bournemouth but doesn’t believe that averages are the key to cutting ‘The Power’. “I was pleased with the way I played last week because I have been putting the work in,” said ‘The Machine’, who has collected four points from his three matches so far. “I hope that is a sign of things to come because I had been a little frustrated. I’ve been practising hard but putting in below par performances. I have been getting decent results though, which shows that averages aren’t everything. van Gerwen takes on Andy Hamilton after a enjoying a fantastic victory over Raymond van Barneveld last Thursday. The Dutch sensation followed that up with an incredible run of 16 consecutive victories, which saw him take both of the opening UK Open qualifier titles in Crawley at the weekend. ‘Mighty Mike’ is in a confident mood as he looks to increase his current points tally of four. “I am very proud of what I am doing right now. It was a great achievement to win both events in Crawley and I would love to go on a run in the Premier League now. Thornton will compete in the first ever all Scottish encounter in the nine year history of the televised tournament. ‘The Thorn’ who has also amassed four points with a win and two draws, takes on Gary Anderson. “It’s absolutely brilliant for Scottish darts,” said Thornton, the wild-card pick who won the UK Open last June. van Barneveld and Simon Whitlock are in action against each other in Exeter, while Adrian Lewis takes on Wes Newton in the other match of the evening. Tickets are selling fast for an exciting summer darts event at The Pyramids featuring two of the stars of this year’s hugely popular Premier League. Michael van Gerwen and Robert Thornton, who shared a draw in a thrilling match when they met in week two of the televised tournament, are the star attractions at the Portsmouth International Masters, which takes place on 20 June. Joining Thornton and van Gerwen, who won the sold out Untouchables events at the same venue before Christmas, will be two more high profile stars in the form of charismatic duo Paul Nicholson and Ted Hankey. Local professionals Andy Jenkins and Les Wallace will complete the line-up for what is set to be another fantastic night of top quality darts. And Scotsman Thornton, the reigning UK Open Champion urged fans to make sure they don’t miss out. He said: “I’m really looking forward to this one and I’ve heard it’s selling well so people wanting to attend should get in there quick. “I didn’t play in the last event at the venue but have been told fantastic things from the players that did. Premier League Darts star Simon Whitlock has announced a deal to sponsor promising 20-year-old Keegan Brown. Brown, who started 2013 ranked 86 in the PDC Order of Merit, is to be sponsored by ‘The Wizard’ with immediate effect. The youngster has shown flashes of his ability since winning a tour card at the 2012 Qualifying School, winning a Youth Tour event and, perhaps more impressively, reaching the semi-finals of a Pro Tour event in the last twelve months. Whitlock, the world number five, believes that Brown has the potential to become one of the sport’s top players in years to come. “I am delighted to be in a position to sponsor such a promising young player,” said Whitlock, the reigning European Champion. “Keegan has huge potential and is a great lad. He was the perfect fit for what I wanted to do. “I know how important sponsorship is for a dart player so I wanted to help out and make sure Keegan is given every chance to achieve what I know he is capable of. 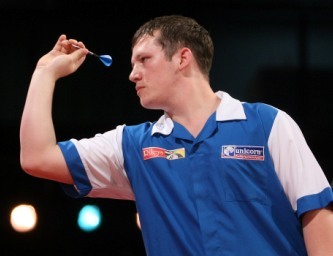 Brown became the youngest ever male to play county darts when he made his debut for the Isle of Wight back in 2006. He went on to play on the BDO circuit, qualifying for the Winmau World Masters, before going on to progress from Q-School comfortably. Michael van Gerwen completed a brilliant double by winning both of the first two Speedy Services UK Open qualifiers in Crawley at the weekend. ‘Mighty Mike’, who has now won the last three Pro Tour events consecutively, defeated Dave Chisnall in Saturday’s final before seeing off Brendan Dolan in Sunday’s decider. “This feels amazing,” said van Gerwen, who grabbed the £6,000 first prize on both days. “Not many people have won two of these in the same weekend so I am proud of myself for achieving that. There was also success for reigning UK Open champion Robert Thornton, who hit a nine-dart-finish in his quarter-final defeat to Chisnall on Saturday. Raymond van Barneveld reached Sunday’s semis but was beaten by Dolan, after ‘Barney’ had ended Simon Whitlock’s run to the last eight. The draw for the first European Tour event of 2013 was also made at the weekend following the qualifier, which took place on Friday evening at the K2 Centre. John Henderson’s reward for progressing through that qualifier was a first round clash against fellow Scotsman Thornton at the inaugural UK Masters. Arron Monk, who also won through Friday’s qualifier, will face Ian White at the Minehead event in March. Whitlock faces Finnish World Cup star Jarkko Komula, while James Wade was drawn against Adam Hunt. van Gerwen will play Jelle Klaasen, van Barneveld is up against Tomas Seyler and James Hubbard will face Nigel Heydon. Vincent van der Voort meets Tony West, Mark Webster will take on Simon Craven and Paul Nicholson will play David Pallett. The £100,000 event takes place from March 8-10 at Butlins Minehead resort. James Wade and Michael van Gerwen produced brilliant performances to take victories in Bournemouth on Thursday evening, while Robert Thornton continued his unbeaten start in the McCoy’s Premier League. ‘The Machine’ and ‘Mighty Mike’ both recorded averages of over 100 in their respective triumphs over Adrian Lewis and Raymond van Barneveld, while ‘The Thorn’ won the last three legs to claim a draw against Wes Newton – a sequence of results that saw the trio all reach four points after three weeks of action. Wade admitted that his 7-4 success against Lewis was his best performance for some time, despite his run to the semi-finals of the World Championships. He said: “I’m pleased to have finally played like this. I felt it was coming because I have been doing it in practise but frustratingly not on the stage. “I made it easy for myself against Adrian and it felt really good. van Gerwen averaged 104 as he claimed his first win in the tournament with a rampant 7-3 defeat of van Barneveld, who had beaten him in the final of the Grand Slam of Darts in November. 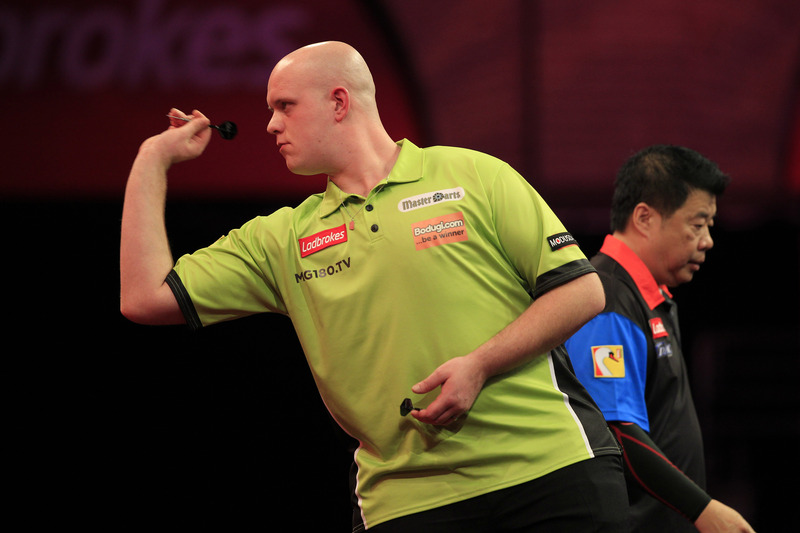 “This was a special win for me,” said van Gerwen, who has also made an unbeaten start to his debut season. “It is a little bit of payback for the Grand Slam but the important thing is that I showed that I am still in form and that I can keep it going. “To beat Raymond van Barneveld on a Premier League stage is something special, especially with an average like that. Thornton hit back from 6-3 down to earn a draw against Newton but there was disappointment for Simon Whitlock, who lost out to Phil Taylor despite averaging over 100. Andy Hamilton saw off Gary Anderson in the evening’s over match. Week four sees the ten players visit Exeter next Thursday, when Wade will face Taylor, van Gerwen plays Hamilton, Thornton meets Anderson and Whitlock and van Barneveld go head to head. Raymond van Barneveld continued his impressive start in the McCoy’s Premier League with victory over Wes Newton in Aberdeen, while Michael van Gerwen and Robert Thornton played out an exciting draw to remain unbeaten after the first two weeks. ‘Barney’ averaged over 100 for the second consecutive week as he cruised to a 7-2 victory over Wes Newton. van Gerwen and Thornton grabbed a point each in a high quality affair, which saw all twelve legs go with the throw. There was disappointment for James Wade and Simon Whitlock however, as they lost out to Andy Hamilton and Gary Anderson respectively. Phil Taylor defeated his World Cup team-mate Adrian Lewis in the night’s other match. Week three sees the tournament reach Bournemouth, where van Gerwen and van Barneveld will do battle next Thursday. Thornton faces Wes Newton, while Whitlock takes on Taylor. Wade is up against Lewis. James Wade, Simon Whitlock and Raymond van Barneveld all got off to winning starts in the McCoy’s Premier League, while Robert Thornton and Michael van Gerwen both made impressive debuts at Belfast’s Odyssey Arena on Thursday evening. Wade made Wes Newton pay for missed doubles as ‘The Machine’ took a commanding 7-4 triumph. Whitlock’s superior finishing saw him defeat Adrian Lewis 7-3, while Thornton enjoyed a 7-5 win over Andy Hamilton. van Barneveld posted the night’s highest average (102.02) in his 7-4 success over Gary Anderson. van Gerwen looked like he might add his name to the winners list when he led Phil Taylor 6-4 but ‘The Power’ fought back to grab a draw. Full reports available on the players’ official websites (click on names to be redirected). England retained their title by defeating Belgium in the final of the World Cup of Darts in Hamburg on Sunday. Phil Taylor and Adrian Lewis saw off Belgian brothers Kim and Ronny Huybrechts to win the exciting tournament in Germany. The pair had earlier seen off Mark Webster’s Welsh team, who enjoyed another successful World Cup campaign. Webster, who was partnered by Richie Burnett, has reached at least the last four stage in all three stagings of the PDC tournament. And Wales almost prevented tournament favourites England from recapturing their crown but were denied a place in the final after surrendering a 3-1 lead in the pairs decider. “It was gutting to go out when we needed just one leg from three,” said Webster, who is hoping to build on his encouraging form. “England showed their class in the end and we’re not too downbeat on reflection. “I thoroughly enjoyed the tournament and played well in patches. I’m looking forward to the rest of the year now. See some of the world’s top darts stars in the Benfield Nissan Masters, Sunderland – Tickets on sale now. Mark Webster led Wales into the semi-finals of the World Cup of Darts in Hamburg as he and Richie Burnett claimed a hard fought victory against Spain. Webster produced finishes of 102, 94 and 76 in a 4-3 defeat of Antonio Alcinas but Burnett suffered a loss by the same score-line against Carlos Rodriguez. The pair then sealed a 4-2 success in their doubles match to set up a semi-final clash against tournament favourites England. “We’re relieved to get through,” admitted Webster, after sealing a place in the last four for a third consecutive time. “It was a bit of a scrappy tie but we got the job done and that’s all that matters. Webster grabbed a break of throw in the opening leg of his singles game, hitting double top after 14 darts. Alcinas responded by hitting the first maximum of the match as he broke back immediately. He then edged ahead with a fine bull finish but Webster hit back with a brilliant checkout of 102. The Spaniard pegged double twelve to move within a leg of victory before ‘Spider’ forced a deciding leg with a clinical finish of 94. And the left hander stepped in to seal the win with another tidy finish, this time taking out 76 after Alcinas missed four match darts. Burnett produced a sensational 156 finish in his singles match but was edged out 4-3 by Rodriguez, leaving the result to be settled in the pairs. Spain moved in front when Rodriguez took out 96 but Burnett levelled on double five. Alcinas took out 70 as Spain wrestled back the lead but Wales restored parity once again when Webster followed a Burnett maximum by pinning double 14. Webster pegged double ten for a timely break of throw before sealing the victory for Wales on double 16. Team Wales will face the English pair of Phil Taylor and Adrian Lewis with a place in the final at stake. Wales produced a brilliant performance to book their place in the quarter-finals of the World Cup in a night of shocks in Hamburg, which saw some of the top seeds tumble out of the tournament. Mark Webster and Richie Burnett did not miss a single attempt at a double and averaged over 98 in a 5-2 success over Canada, with Webster taking out a brilliant 120 finish along the way. Webster said: “I think the 120 was massive because Canada started really well. That gave us a foothold in the game and we went on to put in a top performance. Canada won the first leg before two 180s by Part put them in control of the second but Webster produced a fabulous 120 checkout to level. Part took out 95 to edge the Canadians back in front after Smith had added a maximum of his own. Wales squared up again before Webster took out 48 for a break of throw to give his side the lead for the first time. Burnett then produced the same finish to take them within a leg of victory, which Webster sealed with the aid of a 180, hitting double 18 at the first attempt to maintain Wales’ perfect record. Wales will face Spain in the last eight on Sunday afternoon. Australia, Netherlands and Scotland were all amongst the seeded casualties on an unpredictable night of action.